There are certain things to think of to ensure success before beginning roast a turkey. Remove the giblet bag from the interior of the bird. Remove the wing tips and put everything except the liver in a pot and make gravy or stock. Use the liver in the dressing/stuffing or store in the freezer, covered with milk. Consider whether the bird should be stuffed or the stuffing served as a dressing baked separately. 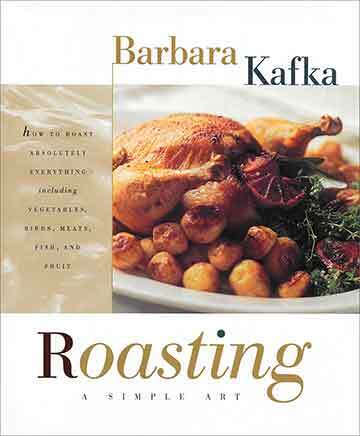 If stuffing, think in terms of twelve cups of stuffing for a fifteen-pound bird, which will allow the big cavity to be stuffed and some more stuffing to be crammed under the skin flap at the neck. I seldom stuff because there are real food safety questions about the bird and its stuffing sitting out at room temperature. The oven must be very clean before roasting or cooking may cause unpleasant smoke. 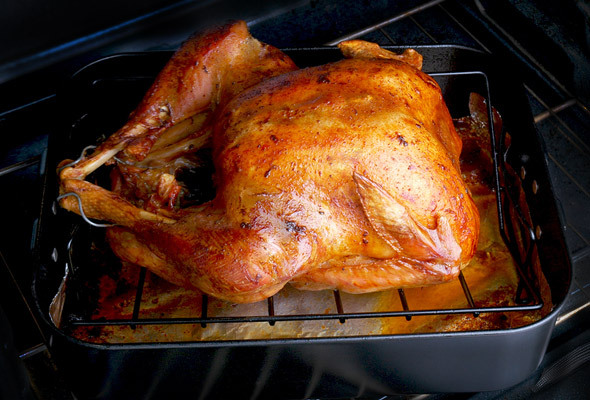 In any case, there will be some smoke if you roast at high temperature such as this Simple Roast Turkey recipe, so turn on the fan or open a window. Don’t put the oven rack too high or the skin on the breast will overcook. For a twenty-pound turkey, the rack should be in the lowest position. Always put the turkey in legs first — dark meat takes longer to cook and the rear of the oven is the hottest area. If the top skin seems to be getting too dark, slip a doubled piece of aluminum foil on top of it. Don’t move the turkey. Use an oven mitt to protect hands and forearms. Remove the foil with the same oven mitt ten minutes before the turkey comes out. Large turkeys are most easily removed from the pan by holding them with two pot holders, which will need to be washed. After the meal, get out a large stockpot to boll up the carcass and leftover bones for turkey soup and stock variations. Originally published on April 12, 2005.